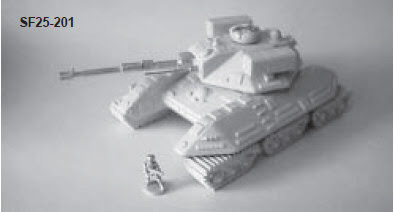 I just saw that Mirliton are re-releasing some 28mm sized (28mm is a size not a scale) resin sci-fi vehicles. I've not seen these before, but apparently they are old Grenadier resin models. I assume that these came from Grenadier US as I never saw them in the UK back in the day. The three better ones I think are these. Don't do it...those Grenadier/Mirliton models are terrible. They should have been left for dead ages ago not resurrected like zombies! As for Walkers...Asimo with a gun...think about it. Asimo has come a LONG way since the first model. The real restrictions are power and programming but give it time...if the thing could control itself, all you'd need to do is tell it where to go and you wouldn't even have to drive it...hands free for weapon control. Don't suspend belief, someone had to come up with the idea of gravity...he was a physicist you know ;). I have mixed feelings about collecting older miniatures - they are sometimes lesser quality but there are also good memories to be found. I like the four wheeled buggy, but I think painting the windscreen is going to be a challenge. I suggest a dull gold or silver, to suggest tinting. I like the second and third models. I think gloss black for the buggy's windows, like the flyer. Inso - I am very able to suspend my disbelief about what may be POSSIBLE. However I just do not believe that trying to construct weapons platforms that behave physically like humans is efficient or economical. There are much more efficient and economical mechanisms to achieve the same or often better results than trying to mimic human walking. I do not doubt that eventually Asimo will develop into something that could be considered a soldier. My argument would be that if the advances in technology necessary to achieve that are applied differently then you could build a much more robust, efficient and cheaper alternatives for delivery of weapon systems. As an example a lot of people thought you could build a flying machine - at first they looked at birds and said "lets make a machine with wings that flap". Its now commonly agreed that we don't have the technology even yet to make something mechanically efficient or strong enough to build a reliable flapping aircraft. In the mean time however a couple of samrt yanks developed the aerofoil, and very quickly it was seen to be a much better solution. No-one other than a few crank pots has tried to make flapping wings since as there is already something cheaper, simpler, more robust and more efficient. I believe the Asimo project and others like it will go a similar route - though there are likely to be some interesting technological spin offs along the way. Actually the guy who put some theory to the phenonemon of gravity was a natural philosopher... ;-) but we split hairs. Had ou seen these grenadier vehicles in the UK then? I thought i new all the grenadier range from the late 80's to early 90's but i never saw these. I thought they might have been grenadier US only? Science doesn't really come into it any way. The cool factor is the only thing that matters when talking about giant walking tanks. Who needs a reason?...they're giant fricking walking tanks for god's sake!!! As for the vehicles, I've not seen them before but their styl has 80's written all over them...and that is where they could really do with being left...but I'm sure that with a few 'Brandlin' tweaks, they'll come up looking OK ;). I spent 18 years in military product development (in the private sector). Efficient i meant more by way of machine efficiency - the power and complexity needed to make a walker work is much greater than controlling say an AI based air vehicle. And compexity is a major source of maintenance issues and through life costs. I agree that the defence sector has more than its fair share of major cost overruns on projects - although i would argue the MOD and DOD have to sholder a large (majority?) portion of the blame for frequent, major and continuing changes to requirements. Going back to your Asimo example - there's a reason it isn't being funded by the defence sector! Oh, and I don't think giant walking robots are cool - they're just ...silly! Well, no one can say I haven't at least 'tried' to convince you ;). I think it is like a Manga thing...you either love the complete weirdness to it all, or you don't. I used to watch a lot of Godzilla, Macross and the like...so I am pretty sold on the whole giant robot thing. Armoured Votoms is very cool too. But I agree that the technical and logistical aspects of walkers is too big a burden for real science...I still like the sci-fi side of the idea though (hence I have so many mechs in my collection). If its a "cartoon-like" sci-fi game then i can go with the look of walkers... but for something that is grittier and more hard SF then i can't. must resist - cannot start new project!